pH – What Does It Mean? 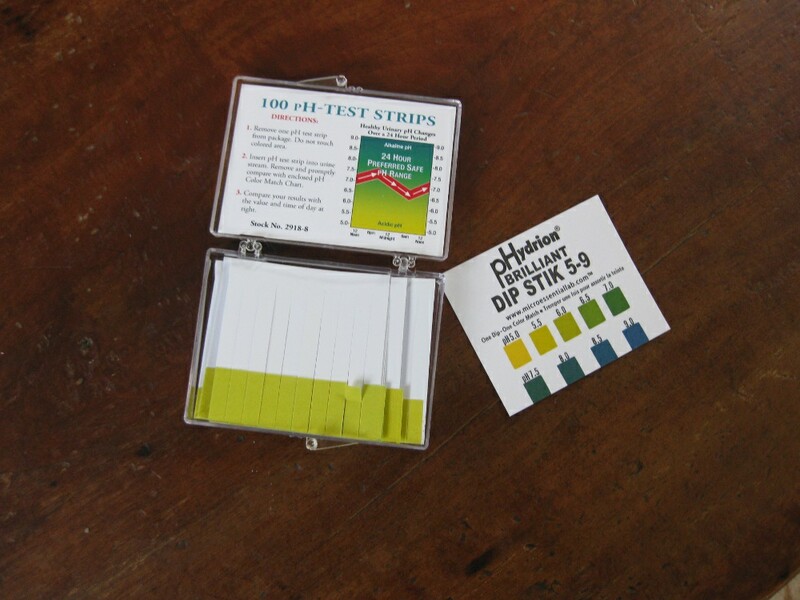 The pH is easily measured by widely available pH test strips (#2918-8). To use simply swipe through the urine stream, or, spit upon the paper. The strip changes color according to the pH of that fluid and then is compared with a color chart (provided with the test strips) to determine the fluid pH. A pH less than 7.0 is considered by chemists as acidic and above 7.0 is called alkaline. (The magic pH for the body is ~ 6.5) These pH readings are generally done first thing in the morning. So the pH TESTING is quite simple, HOWEVER, the INTERPRETATION of the results or the course of action dictated by those results needs a dose of caution and basic principles. Remember the body is intelligent. Most medical people AND unfortunately, many alternative people have adopted the ‘dumb body’ paradigm, and try to force the body fluids into a certain pH range instead of investigating WHY they are what they are. Although some symptoms may abate, leaving the impression that the intervention was successful, these interventions which may be contrary to the healing efforts of the body, can decelerate the process that the body is trying to accomplish. It may be an indicator of another underlying imbalance or the result of an intelligent action of the body. [Recall that feeling better and getting better are sometimes not the same thing.] As such, ‘balancing pH’ by taking alkalizing supplements or alkalizing water may be masking the problem – something a hard-core naturopath or any person with common sense would rethink. The body’s pH is NOT an underlying cause. Typically the body’s urine and saliva pH are said to belong in the 6.5 to 6.8 range. (These levels did not come from Mount Sinai so don’t worry.) D.C. Jarvis, MD who wrote Folk Medicine, A New England Almanac of Natural Health Care showed that 1-2 days prior to getting ill, the the urine pH goes alkaline, AND, the way to avoid or quickly recover from illness is to acidify the urine, AND, the way to do that was by the use of acidic drinks! These kinds of drinks would be apple cider vinegar (ACV) primarily (2 teaspoons in a glass of water, 2-3X/day). His clinical experience, (done by having both adults and children keep food and pH journals for 2 years) give insights regarding why ascorbic acid works. But ACV is a whole food, cheaper and usually in your kitchen. That also explains why cranberries work for bladder problems. Some blood types prefer lemon juice to supply the digestion with acids. All ferments and cultured foods provide lactic acid to lower digestive pH. And the reasons this would be called for is found in this post. Less than 5.0 (Urine does not change the color of the pH test paper – the paper stays yellow) This is good if it means your body is dumping lots of acids. Give thanks for good kidneys. However, if you are stiff in the mornings or your feet hurt in the mornings, you are still generating acids faster than you are dumping them out through the urine. Stiffness is a sign of stalled acids in the muscles. Stress and exercise increase the amount of acids you generate – bad idea in this condition. Rebound instead if you must exercise or use a Chi-type machine for passive exercise. If the pH remains at this level, your bladder may give you trouble and you may have spinal disk compression, ruptures, etc. Work on reducing stress (Cortisol Formula #3209-4) and supporting the kidneys with Chinese KB-C (#1883-3) to encourage good function. Consult with the Kidney document for other indicators of imbalanced kidney function and recommendations, or the Liver document. Often coral calcium or rock calciums are recommended for this – a real bad idea. Between 5.0 and 6.0 (light yellow/ green) Same as above – inconclusive as to how to interpret this. That is, it can be good, or, it can be bad. One must consider the attending symptoms. Again consult with the Kidney and Liver documents which will tell you other indicators of where the underlying may be and what to do to help yourself. Between 6.0 and 7.0 (pH paper has turned green) Not only might this mean you are dumping acids faster than you are generating them – which is good, BUT it can also mean ALL your acids are not being exchanged in the kidney – which is bad. If you are stiff with inactivity, don’t gloat if your pH is a ‘perfect 6.8’, because it may still mean some kind of kidney/liver insufficiency. This is still insufficient data of itself. Above 7.0 (pH paper is dark green to blue) Likely the kidneys are not doing their job well, which may be due to a variety of imbalances. A serious one being lowered circulation thereto. It can also be due to drugs or ill-advised supplementation. Consider the ACV remedy above. Start lots of Bilberry (#74-8) (to clean up the capillary circulation) and T/R St John’s Wort (#653-1) (to support the nerves and liver). After these consider Rosehips (#580-1) which is a ‘sour herb’ that alkalizes body tissues without compromising the stomach acidity as many calciums do. Often you will hear that you need to take a calcium supplement or drink some super alkalized water to get your pH in the ‘good range’. Don’t do it!!! Alkalizing supplements and water do NOT belong in the stomach! The stomach must be kept acid to sterilize your food and for proper liver function. Green foods and drinks are acceptable as they are food (i.e. not rocks or processed mineral compounds) and they don’t compromise the stomach acid which leads to many other sorrows. However, as far as urine pH is concerned I have found Rosehips (#580-1) to be the most effective natural tissue alkalizer. It is a sour herb that encourages bile flow which is THE intelligent body alkalizer. There is a discussion about the dangers of taking Calcium in the section on building bones. Less than 5.0 (saliva does not change pH paper from yellow) You probably have serious dental problems. But equally concerning, your terrain is overwhelmed by long-standing stress which has now affected the liver. Start taking Una de Gato (#175-0). Generally low saliva pH indicates that the liver is having trouble governing the lymph pH which slows down immune response. The liver may have been congested by a toxic bowel but the Una de Gato (#175-0) will open the way. Consult with the Liver document for other signs or indicators of imbalanced liver function and other recommendations. Help the digestion by supplying ACV or lemon juice. Between 5.0 and 6.0 (light yellow/ green) Here you can reduce Una de Gato (#175-0) to a one-a-day and add MSM (#4059-4). There may be too many toxins in the liver but between these two supplements you can help clear the liver. Keep testing your saliva. Between 6.0 and 7.0 (pH paper has turned green) This is generally a good range for saliva pH. The above 2 supplements can be used to help clear the liver function or consider the Gentle Liver Cleanse. Above 7.0 (pH paper is dark green to blue) This can happen if the liver is revved up too much – but it does this for a good reason – usually in response to poisoning or pharmaceuticals. Liver enzymes may also be elevated. You may want to consider Milk Thistle TR (#4071-9) here, or consider the Gentle Liver Cleanse. Remember that feeling better and getting better are two different goals. You can feel better on Advil and morphine or even Ritalin. You can feel better on Coral Calcium, but even natural things in excess cause side-effects, like kidney stones. 2 Responses to pH – What Does It Mean? why do most people say your ph should be at 7.4? my first morning urine usually doest change the paper, I was told I want it to be 6.5, I’m so confused. also you mention alkaline water isn’t good, I’ve been drinking mineral water. I’m sorry Lia but the people who want to force their body’s pH in a certain direction are misguided. Please reread the post for the explanation.